Learning any new technology means learning new words, phrases, and acronyms. We'd like to help you out with this handy guide. The internal yarn-like fibers inside a fiber cable that provide strength and protection; can also be coated with water absorbing material to limit liquid from traveling the length of the fiber. 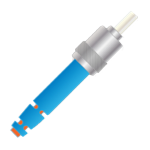 Also known as a fanout cable; a fiber cable containing several individually jacketed simplex fibers packaged together inside an outer jacket. The layer that protects the cable core and provides the necessary reflection for optic signals traveling through the cable. A tool used to score (cut) fiber optic cable. Proper use of a cleaver eliminates excessive cable fractures, ensuring the end face of the fiber is optimum for light transmission. Also known as acrylate; the layer of plastic that surrounds the cable cladding and helps protect the fiber core. The physical center of the fiber optic cable that transports optical data signals; typically constructed of glass or a glass/plastic hybrid. A cable with two strands of fiber; typically of a siamese construction constructed with individual strength members. Stands for GigaBit Interface Converter; a small transceiver that plugs in the GBIC port of a Media over Fiber Optic electronic device, such as a network switch or extender. GBICs convert the audio-visual electrical signals to serial optic signals and vice versa. Serves the same function as an SFP; however, it’s larger in size. The outermost layer of the fiber cable containing application-specific production compounds (riser, plenum, LS0H, etc. ); provides protection for the inner layers of the fiber cable. 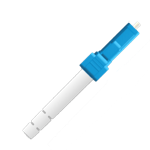 Stands for Lucent Connector; small-format connector style used on most Media over Fiber Optic electronics due to its compact size. Push-pull style of connection. A multi-strand fiber optic cable where the individual fibers are loosely bundled (as opposed to tightly buffered); typically contains a waterproof layer and is used in outdoor applications where cables must expand and contract with temperature fluctuations without damaging the internal fibers. Media over Fiber Optics, or MOFO, is the combination of fiber optic cabling, signal distribution electronics and accessories to create a fully functioning fiber-based audio-visual distribution system. Also known as a distribution cable; a high-density fiber cable containing multiple strands of unjacketed fibers packaged together inside an outer jacket. A type of optical fiber used for Media over Fiber Optic transmission over shorter distances (typically up to 300m / 1,000 ft.); features a larger core diameter and a higher price point than single mode fiber. Stands for Multi-Fiber Push On; connector style used on some Media over Fiber electronics. Guide pin style of connection. Stands for Mechanical Transfer Registered Jack; connector style used on some Media over Fiber electronics. Guide pin style of connection. OM stands for optical multimode and OS stands for optical single mode. Fiber commonly comes in six different formats: OM1, OM2, OM3, OM4, OS1 and OS2. In general, the higher the OM/OS number the higher the supported bandwidth and transmission distance. Stands for Small Form-Factor Pluggable; a small transceiver that plugs in the SFP port of a Media over Fiber Optic electronic device, such as a network switch or extender. SFPs convert the audio-visual electrical signals to serial optic signals and vice versa. Serves the same function as a GBIC; however, it’s smaller in size. A type of optical fiber used for Media over Fiber Optic transmission over longer distances (typically over 300m / 1,000 ft.); features a smaller core diameter and a lower price point than multimode fiber. 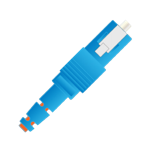 Stands for Subscriber Connector; larger-format connector style used on some Media over Fiber Optic electronics and most network electronics. Push-pull style of connection. A tool used to cut excess aramid fiber/yarn during fiber optic cable termination. Note: the sheers are not used to cut the fiber cable itself (see Cleaver), but only the aramid fiber/yarn. A cable with only a single strand of fiber. 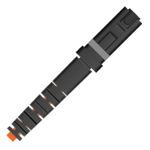 Stands for Straight Tip; bayonet connector style used on some Media over Fiber Optic electronics (more common in broadcast). Twist style of connection. Inner jacketed fibers that help protect the cable core against damage during installation and handling. A multi-strand fiber optic cable where the individual fibers are tightly bundled (as opposed to loose tube) for a smaller diameter sized and more flexible cable. Stands for microns or micrometers; the unit of measure for fiber optic core and cladding size. Typically, cables with a lower µm diameter transmit signals further and at higher bandwidth ratings. A tool used to find breaks in fiber optic cabling, as well as high loss areas around connectors and/or junction points. A visual fault locator emits a beam of light down the fiber cable and the light becomes visible through the cable jacket at a break or loss point. OM3 Multimode 50µm 1,000m / 3,280 ft. 300m / 1,000 ft. 100m / 330 ft. 100m / 330 ft.
OM4 Multimode 50µm 1,000m / 3,280 ft. 550m / 1,800 ft. 125m / 410 ft. 125m / 410 ft.
Download a pdf version here: Media over Fiber Optics™ Definitions & Acronyms.